Clearly Remington is more excited about moving than are we. 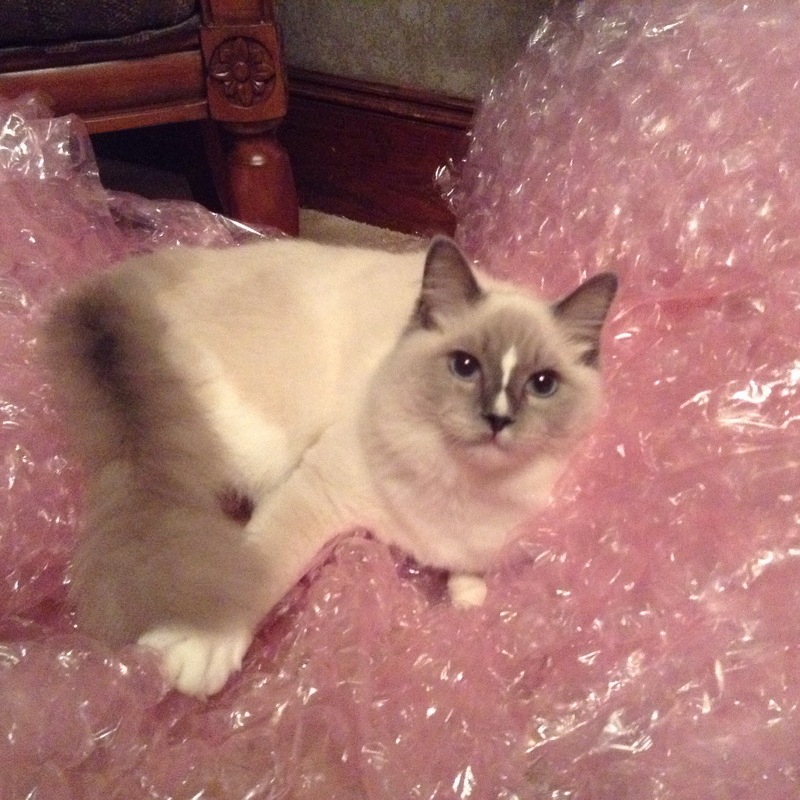 He’s been swimming in bubble wrap since last night. Haha! I hope wherever you are moving is far away from a metro city. I’ve been thinking about getting a cat for these rat bassturds around here. I think I’ll name it…. Napalm. We are currently close to 3 cities flee. Where we are moving can’t be seen from the road and there are no houses in sight, and very far from any city with roaming leeches. 4 weeks and counting. I can’t wait! Get a cat for them rat bassturds! I’m getting another sometime this year. I’m naming her katana. She and Remington will kick arse! I love cats, live out, and am dealing with bobcat disease that is making my life hell and costing me a fortune even though I have a very charitable vet. If you love your cats research cytauxzoonis and keep seresto collars on your cats. I hate Bayer as much as the next girl but that collar is about the only defense I have against this horrible disease. Most people don’t even know it exists. I have had 5 cats with it now and 3 lived due to my vet. Most vets don’t have a clue how to treat it but mine does. Just look it up if you are a cat person. I’m sorry to hear that sharon. I have never heard of it before, and I will do some research on it. Thank you for the info. I hope you’re doing well. Nice cat you’ve got there. I remember reading somewhere that mice and rats will often avoid an area where a cat lives because they can detect the cat’s scent. So a cat can help keep mice and rats away even if the cat is lazy or just old. Thank you BMF! He’s a sweetie. My daughter told me that mice and rats will never occupy the same space. Yeah, mold can be very bad news for your health, even without a pre-existing health condition like yours. Asbestos isn’t exactly your friend, either. Moving to a new place ought to do you good. I’ve always thought mice and especially chipmunks were cute little critters, but I wouldn’t want to share a residence with them. There’s room for only one furry rascal in this house (and he’s sleeping on my lap right now). Thank you for your kind words. Everything will work out fine. I’ll be happy to be rid of the unwelcome critters. They tend to make their presence known in the walls and ceilings. They sound like they are bowling! Haha! That is one pretty cat! It kind of has like a cross on it’s forehead, likes it’s showing you the light. I love animals. And good luck on your move. Thank you for your best wishes on our move. It’s time consuming now, but once we are settled everyone can breathe. I love you’re artwork. Keep them coming! The last move is always the hardest. I can’t even explain how hard it was to get here. It’s just amazing how much crap you accumulate over the years that you just can’t let go. I had to move and sell my Uncle and Aunt’s house. Going through there stuff was a daunting task. I spent a whole week just shredding stuff into 5 garbage bags. Thank you! Oh.. You meant the kitty. LOL LOL 🙂 His mom and dad are beauties. His papa won CFA awards. I wish I could post them. I’ll have to email you.